When ‘Little Miss Popular’ Ruby Kaye lands a pair of super-tech glasses (invented by brainiac college geek Trevor Goldstein) in a game of Strip Poker, she’s granted flight, super-strength, and – due to a flaw in the glasses’ programming – super-klutziness! And this is just the beginning of the changes the glasses will wreak on Ruby! 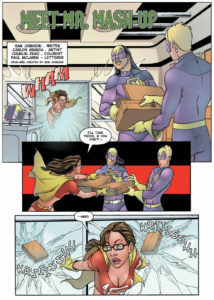 In this specially priced ‘JUMP-ON’ issue that features a bonus recap of Geek-Girl #1-#2, Ruby Kaye is ready to fully embrace being a super-hero. …But is she ready for Mr. Mash-Up? Being a super hero is tough on the social life. No one understands this better than former popular girl Ruby Kaye as she struggles with her new life as a super-strong flying heroine. The hero gig doesn’t come with a manual, so she’s learning on the job, and her former friends don’t seem quite as awesome as they used to. Ruby finds herself outside of the popular crowd for the first time in her life, and still hasn’t figured out how she feels about that. On the plus side, with Maine’s two home-town heroes Neon Girl and Pit Bull out of commission, there always seems to be a villain or two to focus on. She won them from Trevor in a game of Strip Poker. Thankfully, from such humble beginnings Ruby is starting to show some growth as she lives the life of the hero. In a great example of living like the person you want to be, Ruby finds her world opening up to the things she never really thought about before. Such as a growing friendship with waitress Mariella, someone she’d never really considered before, beyond the occasional latte’. Now, when Ruby learns that Mariella is worried about her ex-boyfriend after some strange goings on, she realizes that Geek-Girl is more than a cheesy costume she flies around town in. 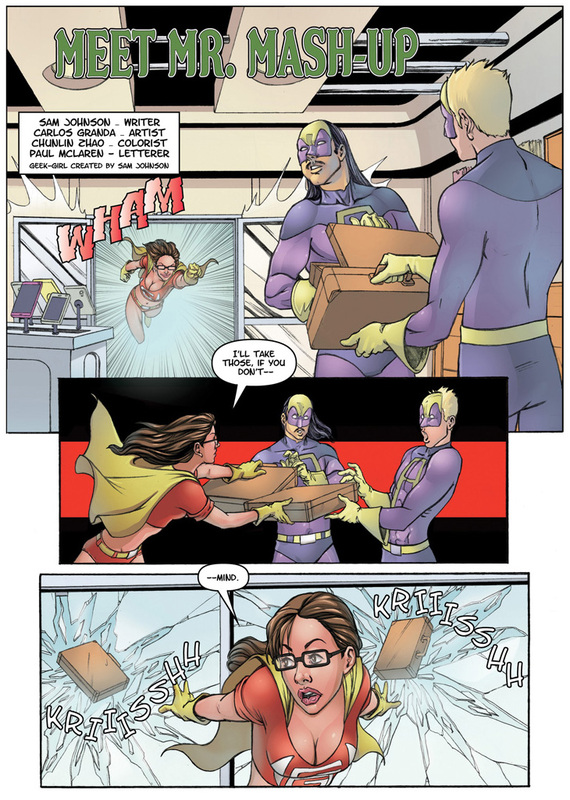 Geek-Girl is undoubtedly a tongue-firmly-in-cheek type of story about a shallow popular girl learning and growing to fill the boots of the hero. That humor is important when looking at a scantily clad Ruby on the cover, because it gives the depth necessary to carry the book beyond the realm of adolescent eye-candy. Given the beginning of some solid character growth on Ruby’s part, it’s the boost that Johnson’s story needed to elevate it a bit. With solid artwork from Carlos Granda, all clear colors and just detailed enough, things are looking good for Ruby Kaye and company. The premise of this kind of story, with its obvious and potentially controversial eye-grabbing characters, is a gamble. Sure, the teenage boys are going to be drawn to Ruby’s impressive… um… design, but that demographic alone can’t carry a title for long (Lady Death’s popularity notwithstanding). It’s good to see the progression of a story arc alongside Ruby’s personality development, and encourages me to keep on rooting for this independent entry into the realm of superhero comics.